There are indoor and outdoor swimming pools, & a fitness centre, children's playground. The hotel has 180 rooms over 4 floors, complete with satellite TV, radio, telephone, mini bar, en suite bathroom with hair dryer. The Estrea Palace opened in september 2004 and is of excelent standard,the rooms are of a comfertable size with twin beds and a single sofa-bed for a third occupant. Set in a well landscaped plot a few mins. from the resort centre and ten mins. 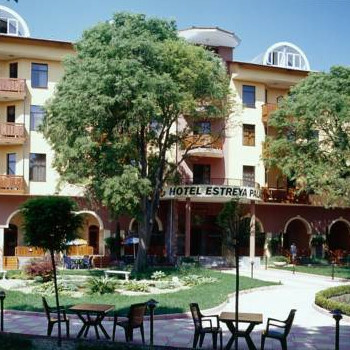 From the beach the hotel shares two small pools with its sister hotel the Estra Park (3 star). We found the house keeping staff excelent but the front of house and resteraunt staff a little sullen. The food was a big let down. We expected continental breakfast (as this hotel is aimed squarly at the german market) but the evening meal was verry poor for the class of hotel limited in selection not well prepared or presented and only listed in german we both thought it only worthy of a 2/3 star establishment. This was supprising as we had arrived after the dining room had closed and the reception arranged for us to dine with the staff that evening,we had a typical Bulgarian 3 course meal which was absolutly delicious and well up to standards. although only a short walk to the busy resort centre and bars the hotel remained quiet and relaxing. There was no entertainment at the hotel and no animation facilities for children.